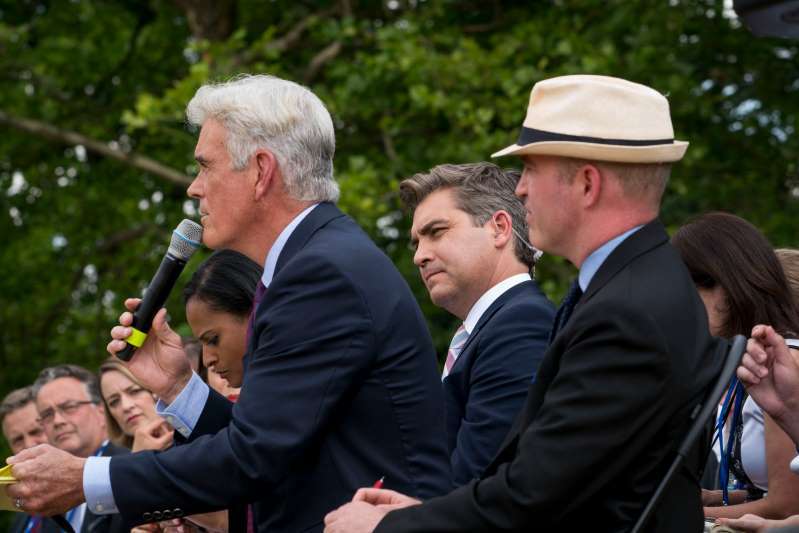 John Roberts of Fox News, left, along with Jim Acosta of CNN and Jeff Mason of Reuters played major roles in a news conference held by President Trump and Prime Minister Theresa May of Britain on Friday. [post_ads]President Trump was in Britain on diplomatic business. But on Friday, he often appeared focused on a topic that comes more naturally to the showman president: the news media. Nonstop denigration of journalists has become an indelible part of the Trump presidency, so routine that it threatens to recede into the background noise of this chaotic administration, a low hum lost in the racket. But in taking his act on the road, Mr. Trump gave a fresh audience a front-row seat to his treatment of the press. The spectacle of a president bashing his nation’s news organizations on foreign soil — in scenes broadcast live around the world — was a reminder of how Mr. Trump’s conduct with journalists can still shock. The viral moment of the president’s day came when Jim Acosta, the CNN correspondent who is a preferred punching bag of Trump supporters, tried to ask a question during a news conference with the British prime minister, Theresa May, at the Chequers estate in Buckinghamshire. Mr. Trump dismissed the query with a wave. President Trump at a news conference with the British prime minister, Theresa May, at the Chequers estate in Buckinghamshire, England. “We’re a real network, too, sir,” Mr. Acosta protested, visibly perturbed. Mr. Trump ignored him, and Mr. Roberts moved ahead with his question. The exchange prompted some intramural squabbling among news outlets — another sign of Mr. Trump’s skill in not only insulting the news media, but in dividing it as well. Those sympathetic to Mr. Acosta asked why Mr. Roberts or the other correspondents who asked questions afterward had not paused to publicly defend CNN or its correspondent. They invoked an episode from 2009, when the Obama administration tried to ice out Fox News reporters, and other networks, including CNN, protested in solidarity. Mr. Acosta’s name went unmentioned in the statement, prompting a CNN executive, Matt Dornic, to ding Mr. Roberts for a “glaring” omission. “Next time try and show some class,” Mr. Dornic wrote on Twitter. Not all of the news conference was so fraught. When the president called on Jeff Mason, a White House correspondent for Reuters, he complimented the reporter on his headwear. “I like your hat,” Mr. Trump said. “Thank you, sir,” Mr. Mason replied. “You look good without it, too,” the president added, before praising Mr. Mason’s “good solid head of hair” as other reporters laughed. There were more smiles when Mr. Roberts reached over to lift the hat off his head — revealing Mr. Mason’s mostly bald pate. Mr. Trump also used his appearance to do some damage control concerning an interview he had given to The Sun, the London tabloid. 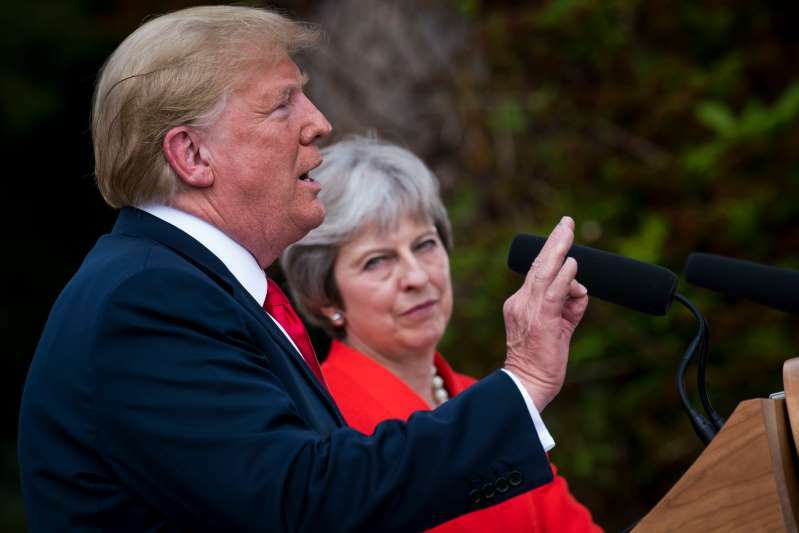 Speaking with the paper’s political editor, Mr. Trump had robustly criticized Ms. May and her plans to withdraw Britain from the European Union, threatening to undermine Mr. Trump’s meeting with his British counterpart. The Sun is considered friendly ground for Mr. Trump because of its owner, Rupert Murdoch, the magnate who also oversees Fox News. But the president called the paper’s front-page story — based on an interview that had been recorded — “fake news,” apparently because he thought it left out his complimentary remarks about Ms. May. No matter. Mr. Trump went about the rest of his itinerary, greeting Queen Elizabeth II before leaving for Scotland, where he planned to visit the Trump Turnberry golf resort. Mr. Morgan, who once hosted a prime-time show on CNN, was granted a 30-minute interview with the president on Air Force One, to be broadcast on the British network ITV. Later, Mr. Morgan posted a photograph on his Twitter account of himself inside the presidential plane’s cabin, beside a seated and grinning Mr. Trump.